Gabrielle Giffords, Democratic Member of the House of Representatives for Arizona's 8th District. Image Source: Blog for Arizona. The terrible and tragic shooting of American congresswoman Gabrielle Giffords as well as several others (with six people killed, including U.S. District Judge John Roll and a nine-year-old girl, Christina Greene, who was born on September 11, 2001, was recently elected to her student council in third grade, and wanted to talk to Gabrielle Giffords about American government) in Arizona today, has provoked soul-searching among America's law-makers, officials and journalists. It has also sparked a storm of debate across the political spectrum about the extreme tensions between left and right political factions in America (while true, much of this boils down to perpetuating that very problem through more political finger-pointing; see here, here and here). The clearing out of the political centre was a result of post-9/11 stress. It did not just occur in the United States, but in Canada, Britain and across Europe - and I would guess, further afield. It also reflected deep uncertainties in the west during the first decade of the Millennium. This is not just about world affairs. It seems we believe western society is on the verge of collapse because we live at the turn of a millennium. There is a subliminal sense that a great revolution is taking place - a change over to a new order, with a new dominant culture. 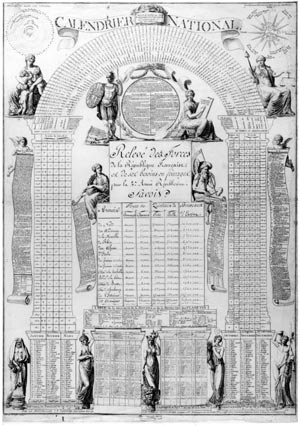 J. F. Lefevre's Revolutionary Calendar. J.F. Lefevre. Calendrier national calculé pour 30 ans et présenté à las Convention Nationale en décembre 1792. Photothèque des musées de la ville de Paris. Museum Carnavalet, Estampe Collection. Image Source: Stanford University. Caption for the above image: On 22 September 1793, the day of the autumn equinox, the first day of the new calendar was proclaimed. At nine o’clock, eighteen minutes and thirty seconds in the morning, the sun reached its true equinox. According to revolutionary gospel, the very moment when day and night occurred in equal duration was the moment when the French people buried for good their feudal past to be reborn as free and equal citizens of the new Republic. "What sense of time is produced through radical politics? Is the understanding of time as future part of a radical imagination? If the commitment to radical social change involves looking forward into the future, will that leave us with a sense of futurity that depends on the linearity of yesterday, today, and tomorrow? ... At its core, this conference seeks to explore the relationship between time and revolution. Time here may mean not just simple clock and calendar time but rather a way of seeing time as part of a material thread that can go this way and that, weaving together the fabric of political projects producing the world otherwise. Ultimately, the question of time fosters a critical engagement with potentiality, potency, and power; as well as with the virtual and the actual, of the to be and the always already. We seek papers, projects, and performances that add to the knowledge of time and revolution, but also ones that clear the way for new thinking, new alliances, new beings. • Radical notions of futurity, historicity, or the expansive present. • Conceptions on the right moment of action. • The political reality of time as stasis or cyclical. • The colonial creation of universal time, and decolonial cosmologies of time. • Work on thinkers of time and revolution. • Work on potentiality, the virtual, and the actual. • Capital and labor time." "This calendar, which celebrated the Revolution as a return to natural time, counted Year One from 1792 and remained in place until 11 nivôse Year XIV (1806). Its major reforms include naming the months after the seasons – Brumaire, Germinal, Thermidor – and replacing the saints of the old calendar with the names of flowers, vegetables and farming utensils. St. Francis of Assisi became the day of the pumpkin while St. Ignatius was dedicated to the aubergine. It also imposed a decimal division onto time. The weeks were divided into ten day units called the décade, while the days of the weeks were renamed Primodi, Duodi, Tridi, Quartidi with the tenth day, the Décadi, as the official day of rest. Ten hour days divided into one hundred minute hours were also decreed, but with little practical success. Accompanying this new division of time into twelve months of thirty days each, were the five or six days added to the end of the year. Called sanculottides these days were dedicated to the new public festivals that were to replace the rituals of the Christian Church. These include the festivals of Virtue, Genius, Work, Opinion and Reward with, every fourth year, an extra day dedicated to celebrating the Revolution itself. ... The calendar, like the Encyclopédie itself, was to serve at once as a new ordering of human knowledge as well as a new model of social relations. Its aim was a rationalization that was also a secularization of time, a way of taking the power of representation away from the king and his priests. In this image, the new calendar is heralded with scrolls describing the destruction of the old regime, a chronology of the world from creation to the end of royalty, the celebrated events of the Revolution, the division of the French territory into départements, the Copernican planetary system, astrology and a compass. The prominent place given to the description of the French forces indicates to what extent a new division of time was linked with a new sense of the French nation as defined by natural boundaries and no longer the body of the King. As depicted in this image, the revolutionary calendar stands at the heart of a Revolution that claimed to be making universal history. At the same time, the contradictions of the new calendar – is it nature or history? a patriotic memorial for the French people or a universal standard of time? – indicate the conflicting representations of time that simultaneously lay claim to represent the new public sphere." It is evident that revolutionaries regard time as linear and progressive. It is ever-new, utopian, yet stripped of all formal religious connotations associated with resurrection. 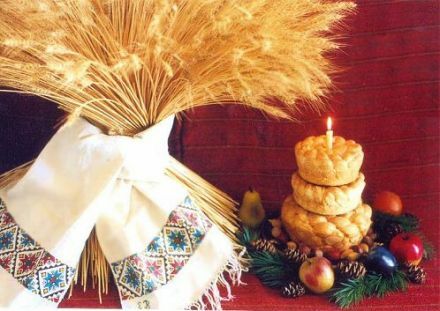 Orthodox Christmas (January 7) technically begins when the first star appears in the sky on Christmas Eve (January 6), starting with a dinner with 12 dishes, one for each apostle. Merry Christmas to all who still follow the Julian calendar. Dead Snapper in New Zealand. Photo by Geoff Dale. Image Source: New Zealand Herald. Further on blog posts on mass deaths of birds and fish elsewhere (here, here and here), several news outlets are reporting mass deaths of fish in Maryland, Brazil and New Zealand. This is being attributed by some scientists to sudden temperature changes. This does not explain, however, why the deaths of fish on the Arkansas River earlier this week were species-specific. For my post on all locations of bird and fish deaths, go here. 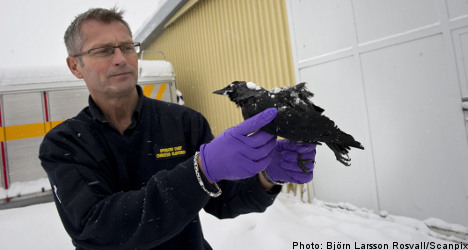 Picking up on similar reports in the United States (which I blogged about here and here), a local news outlet in Sweden is reporting that residents in Falköping southeast of Skövde yesterday discovered dozens of dead jackdaws and pigeons. 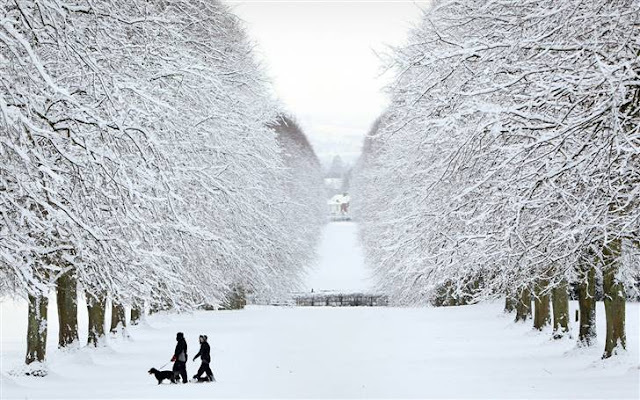 Stormont estate in Belfast, Northern Ireland (December 17, 2010). Image © Peter Muhly / AFP - Getty Images. Image Source: MSNBC. Over the past month, snow and ice have wreaked havoc from London to Moscow to New York. Here are some images where the snow and ice made reality a beautiful fantasy instead of a holiday nightmare. Today marks the last day of Christmastide. NASA artist's concept of Eris. Image Source: Space Today Online. We live in great times. Sometimes the incredible discoveries of our era remind me of this. It's easy to forget them because the daily tidal wave of information is so overwhelming. Today marks the sixth anniversary since the tenth planet, Eris (also known as 2003 UB313), was discovered. 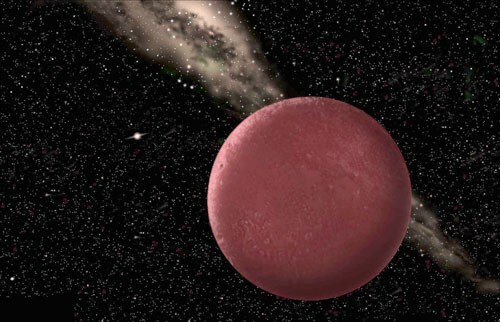 This frozen world, slightly smaller than our moon, is in fact larger than Pluto and has a tiny moon of its own, called Dysnomia. Wiki: "Eris was discovered by the team of Mike Brown, Chad Trujillo, and David Rabinowitz on January 5, 2005, from images taken on October 21, 2003." Dead blackbirds in Lousiana. Image Source: Yahoo. Caption for the above photo: The carcasses of around 500 red-winged blackbirds were found littering a quarter-mile stretch of road in Pointe Coupee, The Advocate reported. A couple of days ago, I picked up (here) on a couple reports about enormous unexplained numbers of dead birds and fish in Arkansas. There have been further reports of dead birds falling from the sky in Louisiana and into Kentucky (here): "Hundreds of birds have dropped dead from the sky in Louisiana just days after a similar mysterious incident left scientists baffled in Arkansas. 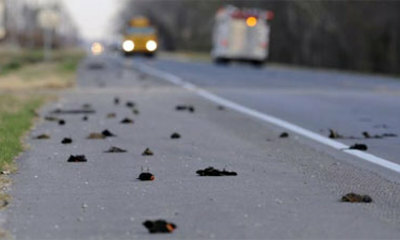 The state borders Arkansas where some 3,000 blackbirds died in unexplained circumstances three days ago. The remains of some of the birds found dead in Louisiana are being taken away for testing. A woman several hundred miles away in Kentucky has also reported finding dozens of dead birds in her garden. ... Around 100,000 fish were also found dead along a river 125 miles away although scientists are not linking the cases. Officials are looking at various possibilities as to why the birds dropped dead - including being startled by fireworks, stress or hit by hail or lightning. Tests on the birds found in Arkansas showed they suffered internal injuries that formed blood clots leading to their deaths, The Associated Press reported. US scientists believe New Year's Eve fireworks may have forced the birds to fly low to avoid explosions, leading them to collide with objects. High winds and tornadoes also struck Arkansas on December 31, with the hardest-hit area more than 150 miles to the west of Beebe." These kind of things have perfectly rational explanations. Yet these news items have rapidly been circulated worldwide, presumably because of their strange and apocalyptic quality that appeals to popular sensibilities right now. Addendum: For my list on all bird and fish deaths, go here. The Electron Microscopy Unit of the Beltsville Agricultural Research Center in Beltsville, Maryland has put some snowflakes under an electron microscope and published the results. Report with images at Wired Science (December 27, 2010). According to the report, "studying the structure of snow is vital to several areas of science as well as to activities that affect our daily lives." All images credited: Electron and Confocal Microscopy Laboratory, Agricultural Research Service, U. S. Department of Agriculture. There are several new space-related headlines. 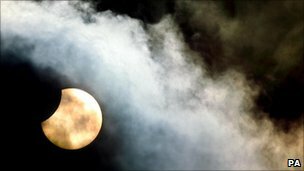 First, a partial eclipse of the sun will take place over Europe and Northeast Asia and North Africa today. Wiki: "Greatest eclipse occurs at 08:50 UT in northern Sweden where the eclipse in the horizon will have a magnitude of 0.858. At that time, the axis of the Moon's shadow will pass a mere 510 km above Earth's surface." The related BBC report is here. 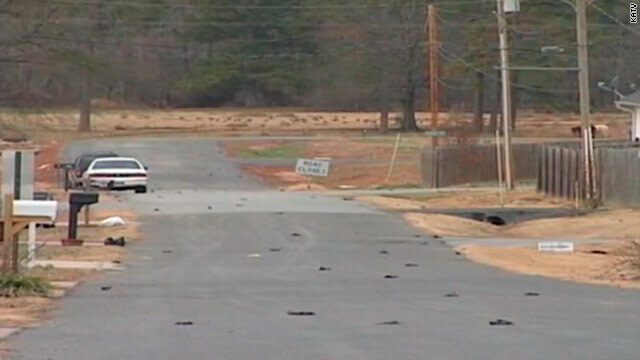 Thousands of blackbirds fell from the sky, right after New Year's, in Arkansas. Image Source: CNN. It would be nice if the news headlines were slightly less random and apocalyptic. Take yesterday's two bizarre reports coming out of Arkansas. One report (here, among other places) stated that some 5,000 blackbirds had fallen, dead, from the sky for no apparent reason. Another report (here) stated that 100,000 fish in the Arkansas River have just turned up dead and are washing up on the state's beaches. Trendhunter reports on festive Paco Peregrin designs that bring the past into the future: "Paco Peregrin for White Sposa has definitely done it again. Teaming up with his faithful stylist Kattaca as well as makeup artist Lewis Amarante, there is nothing he cannot do." Other styles mentioned on the Trendhunter site quickly veer into a mishmash of Elizabethan, baroque and revolutionary historical retro references with a dose of the 1980s and futuristic spacewear for good measure. 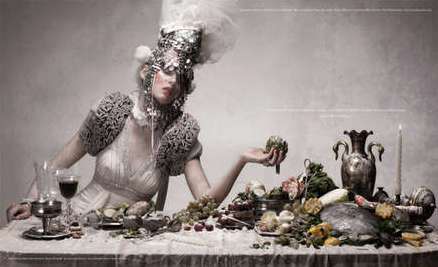 In addition to historical fashion retreads, the trends rely heavily on Darwinian evolutionary themes, with designs, make-up and accessories echoing fish scales, butterflies and other insects. From 'Victorian Surrealism,' to 'Avant Garde Warrior Wear' by designer Manuel Albarran, to military chic - this is the future.